example of the media's addiction to the heroin of violence. Update: The reported body said to have been found in the Bear Lake burned out cabin, "disappeared" from media reports by the afternoon of February 13, 2013. The active focus on Tuesday, February 12, for the Dorner manhunt is on Mentone, California, south of Big Bear. Mentone is a former railroad town and health spa. The town was named for Menton, France. 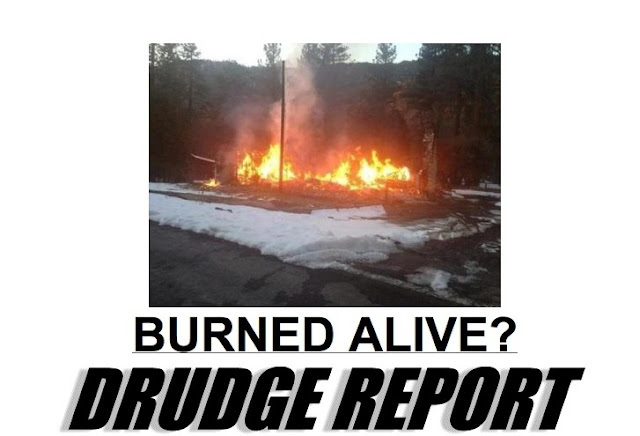 Early reports are that Christopher Dorner is involved in an active firefight with law enforcement officers in the Big Bear area of California, at this time, and the mainstream media is showing it wall-to-wall on television. Live helicopter coverage has been curtailed (a TFR from the FAA), upon request from local and federal agencies. Two sheriff's deputies have been wounded in a shootout with a suspect believed to be renegade ex-Los Angeles police officer Christopher Jordan Dorner, a high ranking law official with knowledge of the investigation said Tuesday, Feb. 12, 2013. Dorner may have been involved in a home invasion and carjacking in the Big Bear area of southern California, the law enforcement source said. Source. This is all taking place in at a cabin on the side of Big Bear Mountain. One sheriff's deputy died from the earlier firefight. Law enforcement officers surrounded Dorner, and one shoot was hear. Then the cabin is up in flames. The San Bernardino Sheriff's Office said early Wednesday morning that investigators have located charred human remains in the debris of the burned-out cabin where law-enforcement officers exchanged gunfire with a suspect believed to be Christopher Dorner. The sheriff's office said the body has not been identified, and that identification will be attempted through forensic means. For more background, see my earlier piece, The Strange Saga of Christopher Jordan Dorner. If they know he is in some cabin, what is the point is searching all these vehicles on the road down? Any chance this whole story is made up right from step one? so cbs la is saying live that the cabin is on fire. but the inland chp live feed is saying nothing about it. Even though the perp is holed up in a cabin in the mountains, I'm betting they are still looking up people's anuses down at the Mexi-Cal border, because you never know when a 270 lb black man might disguise himself as a 71 year old Hispanic woman, like the one in the pickup LAPD shot up in Torrance. And you can be sure the air over LA is filled with police helicopters even though they know the guy they're seeking is 50 miles away. It's all about conditioning and reminding people that they live in a police state. Unless there are hostages in the cabin, a drone might be used to "take out" the "bad guy." Setting a precedent. Wait. A drone could be used even if there are innocent people in the cabin. We do that in Af/Pak every week. great you're on the case! 4 th victim, a deputy died today. SWAT stormed "The Cabin in the Woods"
SWAT vehicle was noted as a "BEARCAT"
URSA MAJOR, (the BIG BEAR) was rising with LEO MINOR (Cat) over BIG BEAR and MENTONE at 00:00 UTC on DAY 44 (2/13/13). I know I'm not alone on this, but doesn't this sort of remind you of, WACO????? New synch spin on Care UnderWOOD's performance at the Grammy's! BARACK = 36 simple and 216 in old english gematria. Drudge is reporting that the cabin was torched on purpose. Do we now have a bizarre kind of martyr? So when will we see the resurrection... the Phoenix rising from the ashes? It does remind of Waco, but it reminds me more of Gordon ahl. If I recall correctly, the FBI shot him in a house when they caught up with him and then burned the house down around him to obscure what had happened. Notice there was no attempt to bring him in alive. No surrounding the cabin and a negotiator or something like that. Just read an article that as soon as they had him cornered they were already planning to just burn him down. No trial, no sentence. Some cops just want to watch the world burn. I've noticed s lot of people in the news lately having the first name Chris. Beginning with the boyfriend of Rhianna (I think), the one who beat her up, then Chris Rock, now Chris Dorner and the schizoid he mentioned in his manifesto named Christopher Gettler. And just yesterday I received an official sounding phone call from someone asking for Chris. This Chris had given them my exact phone number. hey im curious how many people are familiar w/ showtime's "dexter"? anyways i realize this timing was a bit off, but the reappearance of this character as a major player occurred in the dec '12 airings at the end of season 7. the character dies in a fire. is framed by the serial killer. discharged from police force. ex military special operations. just my 2 cents.